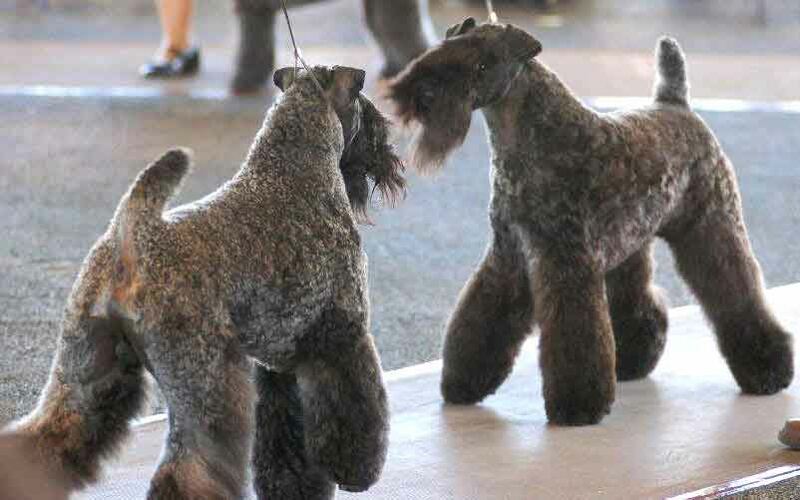 There appears to be a varied number of opinions concerning the practice of “sparring” in the Kerry Blue Terrier ring. Most KBT folks feel that sparring is a valuable [conformation] judging tool used to determine alertness, courage and confidence in a good dog. A true test of KBT mettle is how one reacts among one’s peers or rather how a “noble” might act among his “peerage”.The act of sparring KBTs allows a judge to determine which KBT possesses the greatest amount of poise and fire, tempered with dignity and control. In other words, sparring shows the judge “who’s who”! At almost every all-terrier show, KBTs are routinely sparred at the judge’s direction and at the exhibitor’s choice. Rarely is there an incidence of uncontrollable aggression ever witnessed. One might observe an abundance of excitement but few incidents of “real” fighting.This naturally begs the question: Is sparring fighting? My answer is “no”. KBTs are intelligent dogs, and it’s important to remember that a good measure of their mental quality may be judged on how they react when sparred. When the few fights that do break out, it is almost always due to handler error or inexperience, or broken or slipped leads. Additionally, one must not discount deliberate attempts to rattle a novice handler, which may be employed by a less than sporting seasoned exhibitor. These “tricks” might include allowing the dogs to draw too near each other, or maintain eye contact too long. With experience, most learn to diffuse or defend against such maneuvers. From a judge’s perspective, questions to ask might include: Does the KBT pull itself up on its toes, arching its neck and show interest while exuding a definite attitude of warning to the other dog? Does it drop its tail and refuse to make eye contact? If a dog loses control, will [the judge] reconsider the specimen if the handler pulls out of the spar, only to return and spar successfully? Experienced and knowledgeable bystanders of KBT sparring have questioned the wisdom of this practice in view of the attitudes towards dogs held by the public today. Spectators might consider our breed in a bad light when witnessing, and not understanding, sparring at shows today. Maintaining order in the ring while providing a forum to showcase proper temperament has become more important as dog shows grow bigger, and become more visible to the public eye. To this end, exhibitors and judges must make every effort to learn how to spar KBTs properly; resulting in a picture that is thrilling to behold by all spectators alike. In the end, perhaps we can all agree that there is nothing so glorious as a ring full of beautifully conditioned KBTs, pulled up on their toes, displaying control “resting on a hair” thereby exemplifying true KBT character. If done properly with skill and respect, sparring presents an opportunity to display fine KBT temperament at it’s best!